SunRunr® – Made in U.S.A.
Use at home every day to cut your power bill…and during utility-power outages! Superb also for: Hunting cabins, outbuildings, contractors, farmers, outdoor events, RVs, survivalists, tail-gating, camping and other remote locations where portable or supplemental electricity is desired. 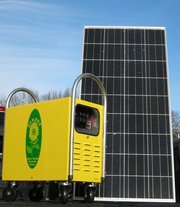 The list of potential uses of Portable Solar Powered Generators is limitless! FREE sun-powered electricity keeps things running, and a SunRunr® system can make it happen for YOU! NO FUEL – NO NOISE – NO MOVING PARTS! Capable of running even high amperage draw equipment (refrigerator, washer, fan, etc) and the entire unit is built for rugged use. No sparks or danger of brush fires, and no need to store flammable liquids. And just one of the best things is no LOUD noise. Gas generator sets, and you having to: Transport Fuel – Pour It – Fill (Spill?) It – Re-Supply Fuel – Smell Gasoline Fumes? The SunRunr® makes those added hassles history, too! Our Price: $6,250* + shipping & insurance — a $300 savings!! Southern View Energy is a SunRunr® authorized dealer and able to offer you the SunRunr® at considerably below factory M.S.R.P. We will secure your specific, up-to-date shipping and insurance costs from the factory to you. The average cost to ship east of the Rockies = $350 for both shipping & insurance, and that is for lift-gated delivery service on Old Dominion Freight Lines. Total shipping weight is approximately 400 pounds. You’re welcome to arrange for different shipping, but do know that ODFL has shipped 1,000’s of SunRunr® units at an excellent price, and certainly know their handling the best. Plus, they provide great customer service. Contact Southern View Energy for your specific shipping details and a firm, completely-delivered price. Have us get a SunRunr® on its way to you TODAY! All SunRunr® Units Qualify For The 30% U.S. Clean Energy Investment Tax Credit – Personal or Business! Special usage rules apply….but they’re simple. Contact Southern View Energy for further details, and consult with a financial advisor as to your specific tax situation & ability to realize timely benefit of this very special solar incentive. Have you seen the late night and weekend “advertorials” yet, or been the recipient of an expanding number of offers to provide you with the security and comfort of a sun-powered (solar) back-up system, for when utility power is out? If not, don’t worry: You haven’t missed much with respect to anything that we’d consider to be of worthwhile power capability or value for the consumer. Strong words perhaps, but we stand by them. The bottom line is this: These are are mainly dressed-up, but fairly light-duty (and usually short lived) “battery centers”, having the apparent ease of a solar recharging feature. Those that don’t know an amp from a kilowatt hour, or the difference between “standard” test conditions and “proven” ones, can be in a world of hurt when it comes time to rely upon such equipment. About the only time that the average person is free of the risks of not knowing these types of things (and 2 dozen others, at least) is when they’ve been diligent enough to engage a committed, reputable, local professional electrical specialist, such as Southern View Energy: We will correctly size and specify the most appropriate equipment for specific emergency power wants & needs. Think that this attention to critical details and our recommended installation can’t possibly be as “affordable” as some of those off-the-shelf units? Relax, because yes it can! And your home or business will be assured of having the emergency outage power system that you need.